We have just completed several intense and productive months, with the 6th SSI/Princeton University/AAS Biennial Conference on Space Manufacturing, the successful completion and operation of Mass-Driver III, and substantial increases in the numbers of Sustaining Members and Senior Associates. Several of these topics are covered in other articles in this issue of Update. 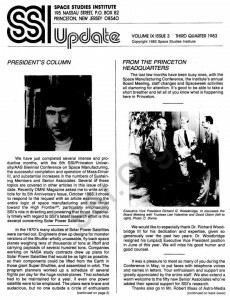 Recently OMNI Magazine asked me to write an article for its 5th Anniversary Issue, October 1983. I chose to respond to the request with an article examining the entire logic of space manufacturing and the thrust toward the High Frontier(sm), particularly emphasizing SSI’s role in directing and powering that thrust. Especially timely with regard to SSI’s latest research effort is this excerpt concerning Solar Power Satellites. In the 1970’s many studies of Solar Power Satellites were carried out. Engineers drew up designs for monster versions of the Shuttle — wholly unusable, fly-back space planes weighing tens of thousands of tons at liftoff and carrying payloads of several hundred tons. Companies working on NASA study contracts drew up plans for Solar Power Satellites that would be as light as possible, so their components could be lifted from the Earth in those giant Super-Shuttles, and assembled in orbit. The program planners worked up a schedule of several flights per day for the huge rocket-planes. That schedule had to be maintained for a year, if even one power satellite were to be emplaced. The plans were brave and audacious, but no one outside a circle of enthusiasts could ever be convinced that Solar Power Satellites were viable in economic competition with coal and nuclear power. About 2/3 of the funding went into environmental impact studies. 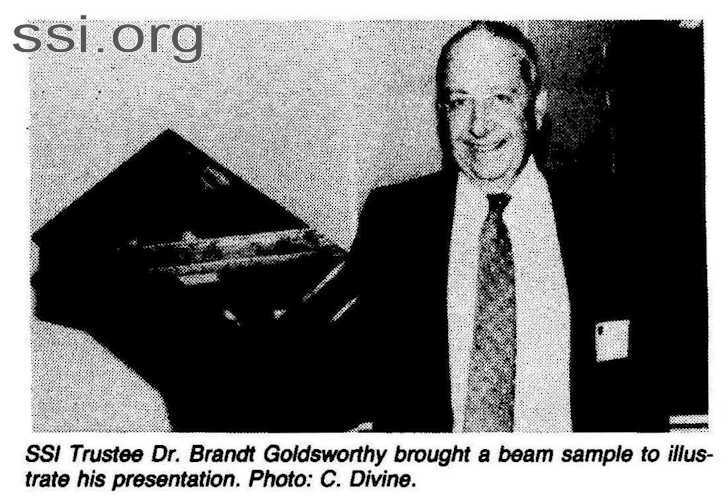 Somewhat to its own surprise, the Department of Energy found no serious environmental impact from the transmission of energy by radio beams. There were several reasons why that technology emerged with a clean bill of health. First, the intensity of the beam (measured as watts per square meter of beam area) was only about the same as the intensity of surnight. The frequency chosen (2.35 ghz, or 2.35 billion cycles per second) was also low. At that low frequency the quanta of energy in the beam were smaller by 100,000 times than the quanta of ordinary sunlight, and therefore too small to damage the molcules of living tissue. There had never been a question of exposure of humans to the energy beam, because the receiving antenna would be mounted on posts above the ground level inside a fenced enclosure. But no one could prevent birds or insects from flying through the beam. The DOE-sponsored experiments found no effect from the radio waves on birds. And in another experiment, no effect was found on even so subtle a natural phenomenon as the dancing pattern of bees. The same general conclusion came out of an independent study, carried out in 1980-81 by the National Research Council, acting for the National Academy of Sciences. But the NRC study thoroughly shot down the power satellite concept, as presented to it by NASA and its contractors. It did so not on engineering or environmental grounds, but on the issue of costs. With the evidence of escalating Shuttle flight costs fresh in mind, the reviewers concluded that the Super-Shuttles could never operate for costs per ton as low as NASA had hoped. They also refused to believe that solar cells, the basic energy conversion mechanism for power satellites, could ever be made cheaply enough. The NRC concluded that power satellites could probably be built, and would probably be acceptable environmentally, but that they could never compete economically with coal or nuclear electric power. In my view, that entire sad history, played out over a period of more than a decade, was a classic example of asking the wrong question and getting a useless answer. While I believe the power satellite concept is fundamentally sound, NASA’s approach to making it happen collided head-on with the facts of basic physics. The energy cost of lifting the tonnage of a power satellite to a geostationary orbit is huge, because we on Earth are at the bottom of a gravity well that is 4,000 miles deep. Fighting that high cost in energy forced NASA’s designers into two traps, one obvious – the direct cost of lift-and the other a little less obvious. Because the designers had to fight those high lift costs, they were forced into complex, exotic designs for the power satellites themselves, to make them as light as possible. For example, they had to use expensive pure-crystal silicon solar cells, for lightness. They could not use the much less expensive amorphous silicon solar cells, because those would have been heavier per watt of power. Nor could they use turbogenerators, powered by sunlight concentrated by mirrors – though that would have been a relatively simple, low-technology solution of the energy conversion problem. But if NASA got the wrong answer by asking the wrong question, then what is the right question? The right question, I suspect, is , “What is the simplest, lowest-risk design for a Solar Power Satellite that could be made of materials already at the top of Earth’s gravity well?” We have a large mine of materials up there, and it has already been assayed more carefully than all but a few mines on Earth. The mine is the surface of the Moon. From the Apollo project we know that the material of the lunar surface is about 30% metals by weight, about 20% silicon and about 40% oxygen. The metals and silicon are just right for building a Solar Power Satellite, and oxygen is the gasoline of space, constituting about 86% by weight of rocket propellant. Continuing to ask what we hope are right questions, we should explore methods for building Solar Power Satellites from the lunar materials, within the limitations of the Space Shuttle transportation system. We like to think that SSI’s program is based on reason and objectivity, and we work very hard to keep it that way. But often, as a result of the warm and thoughtful letters of support that we receive, we are reminded that our drive toward the High Frontier5M depends entirely on people, above all the people who work with us as Members and Associates. To all of you, my warmest thanks. Our success is a success of friends and partners, and I am proud to be among you. The officers and staff of the Space Studies Institute were saddened by the recent deaths of A. Buckminster Fuller and Maxie Anderson. Dr. Fuller served on the Senior Advisory Board for many years, and Mr. Anderson was a former Trustee of the Institute. The last few months have been busy ones, with the Space Manufacturing Conference, the lnstitute’s annual Board Meeting, staff changes and Spaceweek activities all clamoring for attention. It’s good to be able to take a short breather and let all of you know what is happening here in Princeton. We would like to especially thank Dr. Richard Woodbridge III for his dedication and expertise, given so generously over the past two years. Dr. Woodbridge resigned his (unpaid) Executive Vice President position in June of this year. We will miss his good humor and good counsel. It was a pleasure to meet so many of you during the Conference in May, to put faces with telephone voices and names in letters. Your enthusiasm and support are greatly appreciated by the entire staff. We also extend a warm welcome to the fifty new Senior Associates who’ve added their special support for SSI’s research. Thanks also go to Mr. Robert Maas of Astro-Media Corporation for his tremendous help with our direct mail campaign. Our new house appeal, a special gift for this summer’s Solar Power Satellite study, is going very well. It’s not too late to send your donation, if you haven’t already done so, and we wish to thank all of you who’ve already reached deeper into the pocketbook for this project. We especially appreciate the local volunteer work that so many of you are doing or have offered. You are the most important resource the Institute has, and from your letters we are realizing what an invaluable resource that is. Spaceweek packages went out to volunteers all over this country, planning to have displays or booths at area Spaceweek activities. With the potential to reach so many people, SSI could be stronger and healthier than ever by the end of the summer! 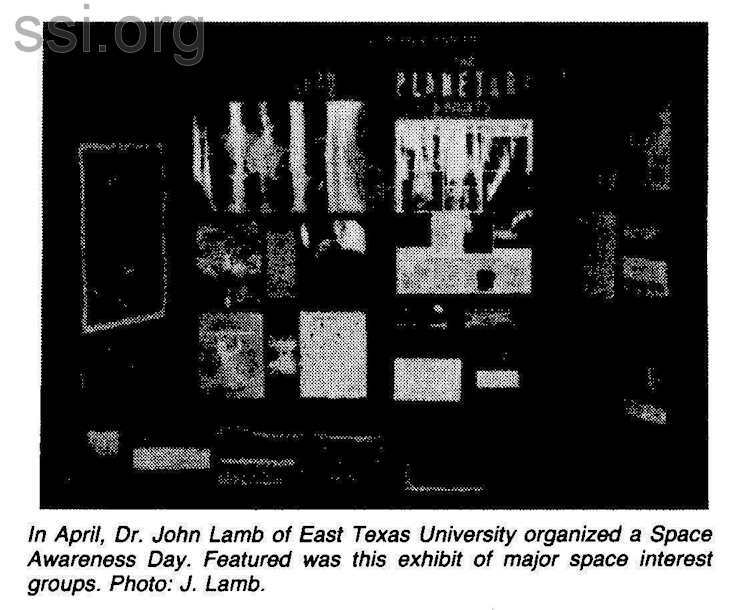 For those of you who have sponsored or who have taken part in Spaceweek events, don’t forget to send us a few paragraphs about your experiences, with clear black and white photographs if possible, to include in the next issue of UPDATE. 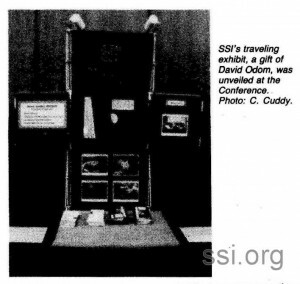 The concept of local group support for the Institute has been tested over the years by SSI Members in several areas. SSI Members have provided local speakers, created slide and videotape productions, sponsored regional lectures and engaged in recruitment campaigns. These activities, which are supported on a local basis without funding from the Institute, are consistent with SSl’s goal of concentrating Institute funds on research instead of administrative overhead. Each team leader is a Senior Associate with a long history of leader­ship and dedication in the space community. In the months to come, we will report on the activities of each team and shall announce the creation of additional teams as they are formed. Members are strongly encouraged to contact the team closest them. Since the first Space Manufacturing Conferences in 1974 and 1975, the meetings hosted by the Space Studies Institute, Princeton University and other sponsors have been the major forum for the exchange of technical ideas in the field. Held every two years in the Woodrow Wilson School on the Princeton Campus, these gatherings have grown from a few dozen to over a hundred participants from every discipline. This year’s meeting, May 9-12, brought together social scientists, medical doctors, habitat architects, lawyers and economists as well as physicists and chemists, to discuss the next steps leading to living and working away from the Earth. Space stations dominated the discussion and seven sessions provided the arena for reporting the latest research. Social and biomedical experts discussed the social and psychological needs of human beings. Habitability design elements beyond the sheer physical necessities of life support systems have to do with how quickly and completely people can adjust to new environments, and what technologies are needed to develop those elements. Tim Vinopal, a Senior Associate and Boeing employee, discussed “open” and “closed” life support systems. His team discovered that different length and distance missions were made more efficient with different life support systems; there was no one best. An intriguing look at successful society structures, and what they can tell us about colony design, was presented by Frank White, an Associate from the Boston area. The policy processes by which space stations develop were presented, as well as a fascinating study of the evolution of humans as wanderers. Ben Finney and Eric Jones pointed out that we have grown from the nomadic groups of thousands of years ago, and now stand, as they did, on a new threshold. That threshold is the frontier of space. They predict that the next biological leap will break out as we again form small nomadic groups to explore the stars. Members of NASA’s Space Station Task Force and related business consultants gave the current ideas for space station construction. To avoid the time and cost overruns and late paybacks of the Shuttle program, space stations may best be designed as flexible, multipurpose modules, not necessarily physically linked. Rather than a huge device, clamped together and so heavy that it takes eight Shuttle launches to get the pieces into space and another one to carry the assembly crew of astronauts, stations are now being envisioned as flexible, multifunction, multipurpose bodies. Either manned or unmanned, base or platform, stations should provide support for transfer and transport to geosynchronous orbit. They should be low-cost, several­segment systems, and provide payback earlier than the Shuttle could. Optimum crews, a mixture of people and machines, and the need for crews to make decisions rather than simply follow preprogrammed steps, were presented. 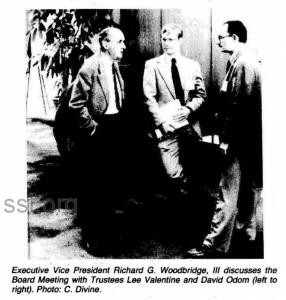 Dr. Robert Frosch, a former NASA administrator, pointed out that the “manned” station vs. “unmanned” (automated) station debaters were engaged in a false struggle. People can perform some tasks better than machines can and vice versa. Combining the best of both pools would greatly increase efficiency and productivity in space. A short historical reminder summed up the manufacturing session. The first communications satellite was launched in 1958, providing a milestone in the use and importance of space. But it wasn’t until seven years later that a satellite was emplaced in geosynchronous orbit, removing the last barrier to efficient worldwide communications service. The Shuttle has overcome the last big obstacle facing the space manufacturer, that of lifting important payloads from Earth and providing a platform for launches into deeper space, on a regular and less expensive basis. Trustee Brandt Goldsworthy of Goldsworthy Engineering presented his ideas for a composite beam building machine, all the more realizable now that Shuttle has made space even more of a highway than a barrier. Use of castoff Shuttle external tanks, power requirements for lunar installations, and the advantages of space in working with electrophoresis experiments were presented in other papers. The international and legal considerations of space manufacturing are many and varied. Government regulation of private enterprise is an increasingly complex and vaguely defined issue. The treaties signed by members of the United Nations to assure fair distribution of extraterrestrial resources present unique problems. Yet governments do have some excellent means of encouraging business ventures, and the suggestion was made that an international solar sail race to the Moon might provide new data in a non-threatening sports arena. Prospecting the Moon and construction of a modest mining facility were outlined in the materials processing session. Reports included a solar furnace, vacuum extraction of volatiles, and a crucible melt process to obtain powdered aluminum. 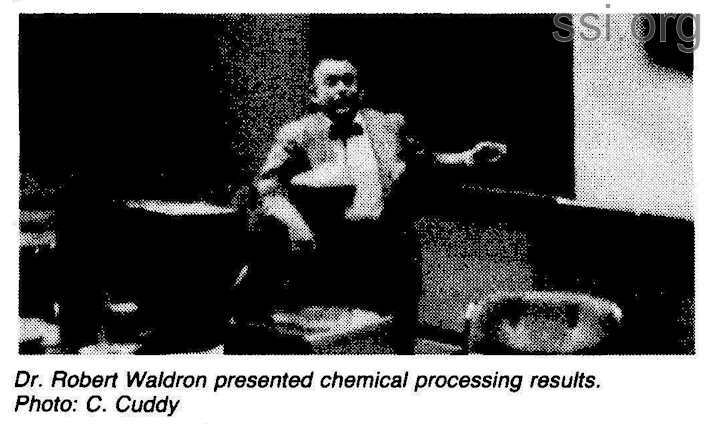 Dr. Robert Waldron of CalSpace presented the preliminary results of the chemical processing research funded by the Space Studies Institute. His charts and diagrams explained a sodium treatment using recycled reagents that was reported to work well. Three presentations, in time frames stretching from the present to 50,000 years in the future, comprised the accelerators and asteroids session. 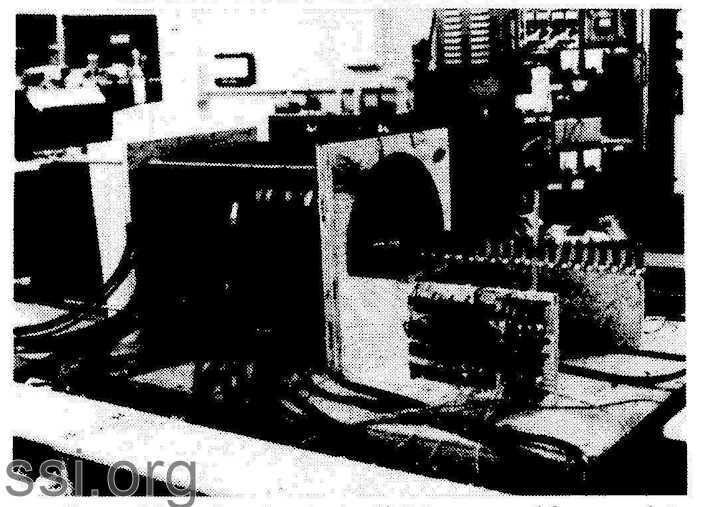 Mass-Driver III, an electromagnetic accelerator under construction at Princeton University through a SSI grant, demonstrated an acceleration of 1100 g’s at less than full power capacity. Former astronaut Brian O’Leary outlined the mission profiles and extrapolation techniques utilizing asteroids as a source of precious and strategic metals. He described an in-situ mining and refining operation weighing only 40 tons, and sketched an economically promising scenario of an A.O. 2001 visit to the Earth­approaching asteroid, named 1982DB. And a convincing proposal was made for comets as human habitats in a few centuries. The bottom line of economic feasibility rounded out the Sixth Space Manufacturing Conference. Session head Clas Wihlborg made the amusing observation that economists have little to contribute to space manufacturing, but, since they “collect principles and speak without knowing much of anything,” they can question the roles of government and private enterprise in that field. He noted that governments step in where markets fan, or where increased risk because of uncertainty or long time frames is involved. The pool of technology and knowledge that grows from individual experiments is not something with ownership rights, and private interests shy away from that pool. Yet those who can best evaluate the risks are those who should take them, and it is not clear that governments are best at that evaluation. Reference was made to the legal machinery already in place, and to the examples already before us in stewardship of common planetary resources such as migratory fisheries. The risks involved in space ventures, and the differing attitudes of government and private enterprise toward those risks, were recounted. It was agreed that some game rules must be established before capital would be readily invested. The great success of the Conference this year was due in large part to the excellent volunteer work of a group from the Washington, DC area and the Maryland Space Futures Association, and to the Princeton Chapter of the Students for the Exploration and Development of Space (SEDS). One thousand thanks, Morris Hornik, Dennis Mateik, Eric Dahlstrom, Chris Cuddy, Marilyn Kirkpatrick, Todd Hawley, Scott Jacobs, Karl Stapelfeldt, Candy Torres, John Fulton, Frank Lemoine, Chris Buja and Peter Diamondis! It would be fun to start off this mass-driver update and say that MDIII was a smashing success at the Sixth Princeton Conference on Space Manufacturing. But that wouldn’t be quite fair in a literal sense (and certainly not in a literary sense either). For many reasons, one of which was spectator safety, the amount of power used during the demonstrations was intentionally kept at about one-quarter the design power level. At that level MDIII is not running at optimum conditions and therefore rather than the crashing bang of the bucket meeting the deceleration section (a few pieces of foam), a rather anemic ‘thump’ was heard. The comment, “Is that all?” was made more than once. However, when asked if anyone actually saw the bucket move through the 24 inches it traveled, everyone realized that it did seem to disappear from its starting position and reappear at the foam without moving through the space between. That may not be as impressive as lots of sparks, bangs and flashes, but perhaps it is more fitting for a device which will hopefully soon become a very mundane, efficient, and irreplaceable part of using lunar resources. For those of you not able to attend the Conference, MDIII was fired successfully many times, by Dennis Mateik and Morris Hornik, two gentlemen who aided greatly in its construction. Accelerations of between 500 and 800 g’s were demonstrated through the first three to four coils. All twenty coils were installed and operating, but because the machine was not being run at full power, the last 16 coils only maintained the bucket velocity, and didn’t induce any acceleration. A comparison between the measured performance of MDIII to that of the M31 simulation that Dr. O’Neill developed shows that they agree to within the experimental uncertainty. 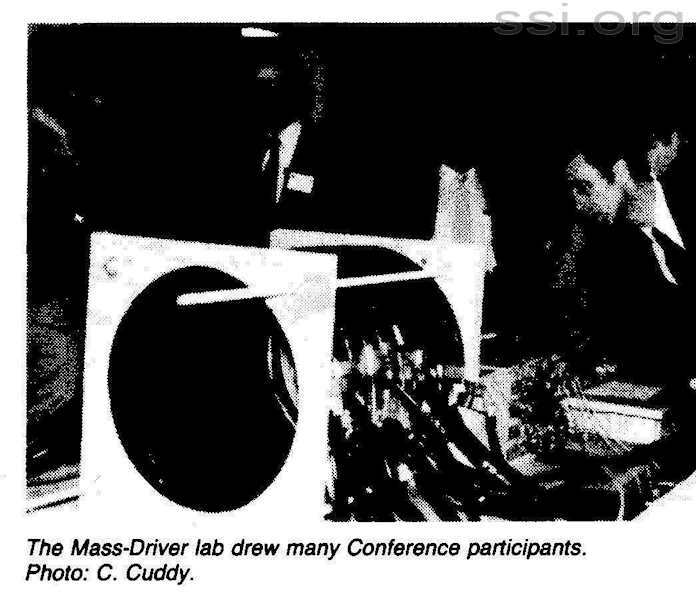 In other words, most of what was to be shown by this stage of mass-driver research has, in fact, been accomplished. A working model has been built and tested using the simplified, self-guiding pull-only design. And its performance matches a sophisticated computer simulation, which indicates that the theoretical and real worlds are not so far apart in this case. However, there is more research, testing and development to be done. Full power tests of MDIII must be made, especially to show that the components can withstand both high accelerations and high current densities. Because of other constraints, that work will probably not be attempted until later in the fall or early next spring. The simulation must be rewritten to run on faster computers so that more than just the first 0.50m section of a lunar mass-driver can be investigated without waiting 18 hours between data points. More of the details involved in a successful working model must be studied carefully such as how to power the bucket, aiming of the payload, the deceleration and return sections, and failure modes and solutions to them. 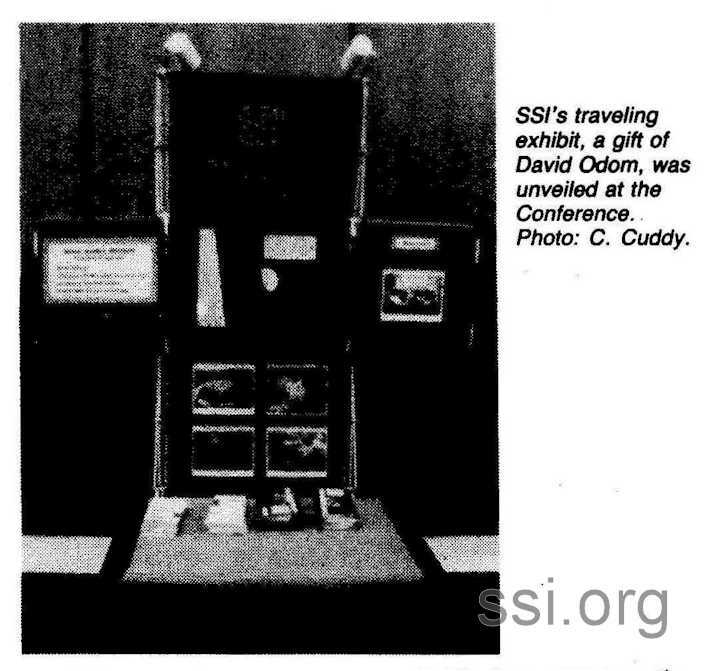 Some of this work could be done by interesting SSI members. Should any of you have the necessary skills, and be so inclined, please let me know. If it looks like the work can be done productively, I’ll get back in touch with you. This will be the last regular MDIII Update column since the work will now become more sporadic. We will let you know how things are going when we have new results to pass along. Thanks to all of you for your support and encouragement of this work, without which we could not have built a successful, high acceleration mass-driver. Among the “other projects you would like to see SSI undertake,” 23% of you responding to the Member survey indicated that lobbying was an important issue. The Institute’s By-laws do not allow us to pay a lobbyist in Washington to persuade voters one way or another, but individual Members can write letters to Congressional representatives. 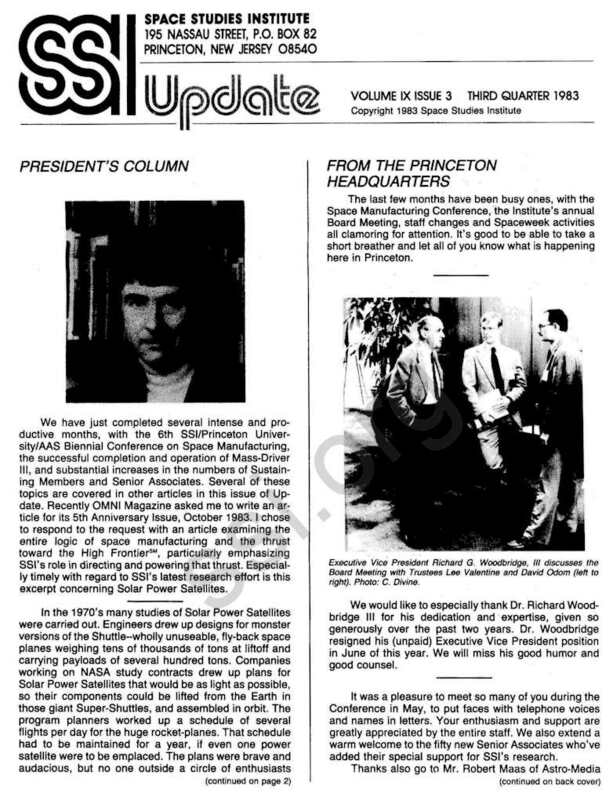 Dr. Philip Harris, a Member in California, submitted this article calling for promotion of a White House Conference on space industrialization. Dr. Harris is a Management Psychologist and author with Harris International, and has recently written the book New Worlds, New Ways, New Management published by the American Management Associations. A section of the volume cites space commerce as one of the new technological markets of great promise. Just as the Conestoga wagon and the railroad opened the Western frontier in the last century, NASA and new technological spinoffs have provided a space transportation system to penetrate the High Frontie(sm) in this century and the next. In the decade of the BO’s, humans throughout the world are thrilled by the continuing accomplishments and implications of the Space Shuttle with its brave astronauts. But what is the next step into the cosmos to be for humankind? Will we use that “high ground” merely for space defense systems? Or will we peacefully develop the resources of this vast universe for the benefit of all the Earth’s inhabitants? Will we use the “heavens” to improve the quality of life on this planet and others? The commercialization of space is well underway with the development of satellites, first for communications and later for solar energy. Shuttle experiments are demonstrating the possibilities of materials and drug processing in microgravity environments. Establishing lunar factories, asteroid mining, and space stations and their crews by the year 2000 is only the beginning. (1) The National Academy of Public Administration in Washington, DC, has published a stimulating report, Encouraging Business Ventures in Space Technologies. 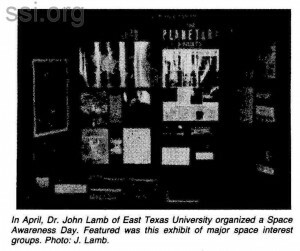 (2) “A Return to Space,” featured in the June 20, 1983 issue of Business Week, is only one of the increasing number of articles about space appearing in national magazines. There is also a rapidly growing national body of literature on space developments ranging from technical publications to conference proceedings. (3) National organizations, such as the Chamber of Commerce and its Junior counterpart, are beginning to call upon the President and Congress for space initiatives, especially with reference to an orbiting space station. A White House Conference on Space Industrialization would focus the attention of the United States, the private sector and its corporations in particular, on the potential for business in outer space. A call by President Reagan for such an undertaking could boost American morale, turn our energies outward, and lead to a re­expression of our national image, as well as communication of national goals that can carry us successfully into the 21st century. A letter to your representatives in Congress, requesting that such a Conference be planned and implemented, will help spread your vision of the social and economic benefits from space industrialization. Your letter can make such a Conference a reality in the next year. During the next several months, Dr. O’Neill will be lecturing and appearing on television across the country. As usual, Senior Associates in each area will receive a postcard notifying them of lecture details. Here is a listing of his appearances, and a short bibliography of interest. · Asterisk(*) indicates lecture closed to the public. September 15, 8:00 pm: Clarkson College, Potsdam, NY. September 22, 7:30 pm: Tulsa Junior College, Tulsa, OK.
October 12, 8:00 pm: Xavier University, Cincinnati, OH. * October 18 and 21, 8:30 a.m.: IBM Corporation, General Technology Division, Tarpon Springs, FL. October 21, 2:00 pm: Bloomsburg State College, Bloomsburg, PA.
New York area WNET-TV (Channel 13) broadcast an interview with Dr. O’Neill on their weekly show “Innovations,” on Friday, July 15. It was repeated July 17. The series will be sold to other Public Broadcasting Stations in Boston, Washington, Houston and San Francisco, and can be seen in those cities after September 1. Science Digest, May 1983 published an interview with Dr. O’Neill, “Physicist as Prophet,” by Associate Editor Elisabeth Rosenthal. Newsweek mentioned Dr. O’Neill in “No Joy Riding Allowed,” June 13, 1983, on page 40. The correct title of his book is “The High Frontier,” and is currently available as a Doubleday/Anchor Press paperback. 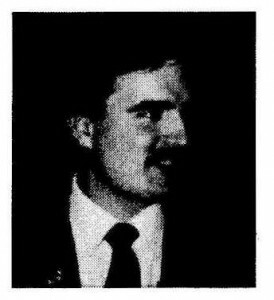 L-5 News, June 1983, reported on the Space Development Award presented to Dr. O’Neill by the L-5 at their Second Annual Space Development Conference held in Houston. 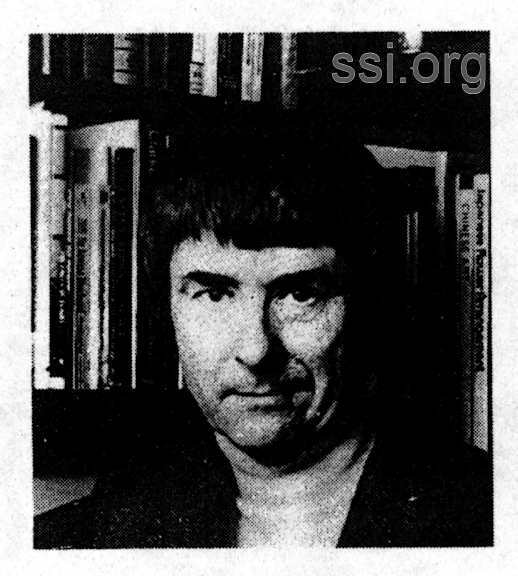 The Fifth Anniversary issue of OMNI (October 1983) will include an article written by Dr. O’Neill about SSI’s research-in-progress. 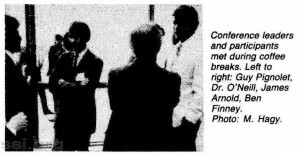 Opportunities is Dr. O’Neill’s new book due for release November 1983. Based on extensive interviews with corporate directors in the US and abroad, Opportunities shows the strengths and weaknesses of high-tech industry in Japan, western Europe and America, and offers suggestions to American firms for regaining industrial dominance. [ ] Send me ___ Sustaining Member recruitment forms. That’s the number of people I will personally try to recruit as SSI Sustaining Members.